Despite being landlocked, Armenia can still boast of its “blue pearl”, the majestic Lake Sevan. This unique natural reservoir is one of the biggest and highest freshwater lakes in the world. The lake spreads its waters along the base of the Geghama mountain range bordered by the Sevan, Vardenis, and Areguni mountain chains. A total of 28 rivers flow into Lake Sevan and it is the source of the Hrazdan River. In 1978 this natural heritage became a National Park to protect the fresh water reserves, fish stock, its bird assemblages and historical monuments, as well as to regulate tourism and recreational activities. The area has also been declared a Ramsar site and recognized as a wetland of international importance. Today Lake Sevan and its surrounding wetlands serve as a stopover point for many migratory waterbirds and shorebirds which stop to rest during their lengthy journey at spring and fall migrations. In winter herds of swans, cormorants, herons and egrets, and a high diversity of wader species choose the lake as their wintering habitat. Over 260 bird species have been observed in the area from the early 20th century. 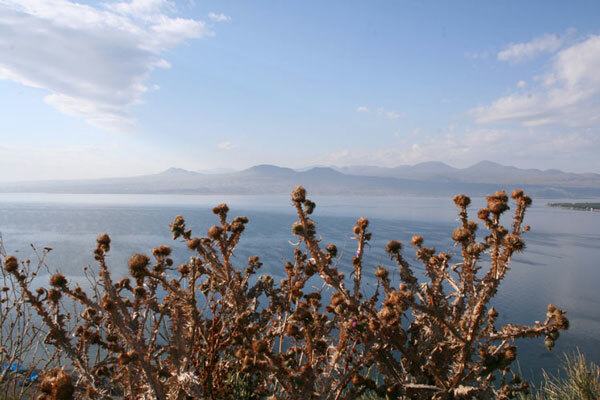 The Lake Sevan National Park incorporates a number of strict reserves and reservations. Norashen Reserve was established to protect a unique and well-known breeding ground of Armenian Gulls (Larus armenicus) – the so-called 'Gull Island'. Colonies of Armenian Gull breed here making up a significant proportion of the entire species population in Asia Minor. The colony boasts one of the largest in the entire Caucasus and the world. However, back in late 1990s it seemed that--due to the decreasing level of the Lake--one of the islands had connected to the mainland and part of the colonies of Armenian Gull had become susceptible to human and animal disturbance, which strongly affected nestlings. It was possible to rescue the colony thanks to a well-timed and generous donation by the late Mr. Sarkis Acopian, the renowned Armenian philanthropist and avid naturalist, who helped organize drilling works to separate the island from the mainland. This measure saved the endangered part of the colony. Species also found breeding on the island include Ruddy Shelduck, Mallard, Gadwall, Eurasian Hoopoe and Northern Wheatear. The continued reduction in water level of the lake eliminated most of the wetland habitats along the shoreline. As a result of these changes, breeding grounds for the majority of water birds were lost and remained so for many years. A substantial increase in the water level began in 2000, an effect of which was the appearance of shallow wetlands, suitable roosting and foraging sites that have begun to attract many water birds and wetland-dependent species during breeding, migration and wintering periods. Just in 2008 the first colonies of Glossy Ibis, Black-crowned Night-herons, Squacco herons and Little egrets have appeared in dense stands of sea buckthorn on Gull Island and are re-establishing their breeding for the first time in 30 years. Despite Norashen Reserve is known for 'Gull Island', other sought-after species that can be found here include Great Cormorant, Little and Great-crested Grebes, while a variety of shorebirds such as Green Sandpiper and Little Ringed Plover can be seen foraging along the shorelines of the lake. Small groups of migrating Geese, Common Shelducks and other ducks can often be observed during periods of spring and fall passage. Many diving ducks such as Common and Red-crested Pochards are seen flying over the area occasionally stopping to rest. Flocks of many hundreds Garganeys and Common Teals also stop to rest before their journey further south.